Brush Wizard: Captain America - The Third Avenger. Captain America is completed and he's the most in depth conversion yet for the Avengers crew. Unlike Iron Man which just needed a piece cut off, or Hulk who needed hair and pants added. Making Cap required cutting, filling and even a bit of custom sculpting. The basis for Captain America is a Chronoscope mini named Zenith, who is actually more of a Quicksilver style character. He came complete with a full body suit and hardly any extra details, which was perfect for making Cap's outfit work. The only problem was Zenith has goggles on, and that meant I'd need to do a head swap, for sure. And that's where this huling barbarian guy came into play. 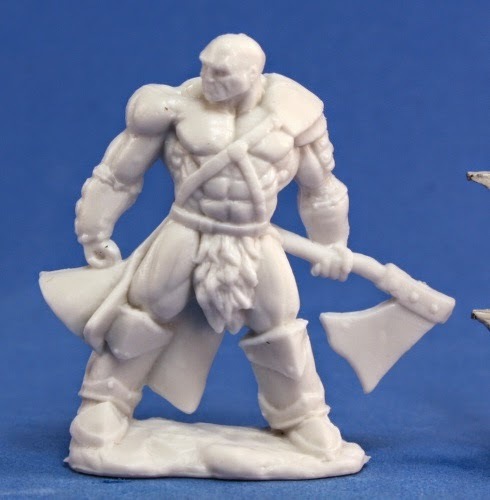 I needed a head that was bald, so that I didn't need to cut hair off and resculpt and lucky for me he came in my Vampire pledge of Reaper Bones. Being that he's a Bones model, it made it super easy to cut his head off and I only needed to use the hobby knife, rather than the razor saw. Cutting Zenith's head off was a little bit of a hassle, but it was able to get a good angle on it with the razor saw. Other than the Barbarian's head almost getting lost a couple times while fumbling and dropping it. The surgery was a success, and Cap had a brand new melon to call his own. Once his head was on the new body, I took some green stuff and filled in the gaps around the neck and smoothed it out over his ears to make it look like it's covering them. Unfortunately it wasn't until later that I realized that in the comics, Cap's ears are visible. But since I decided to paint the wings on his head rather than sculpt them, we'll just call it a mash up of Comic Cap and MCU Cap. The next challenge, after figuring out the head stuff, was the shield. 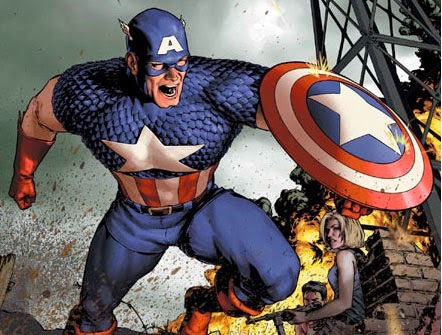 Captain America has a very specific style of shield. 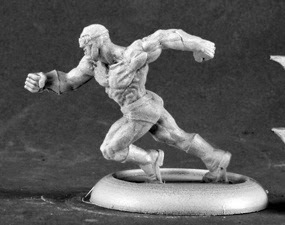 And nothing that is available in any miniatures line seems to fit the bill. I tried a few different things in order to get it to work. The first was cutting out the domed part of an old Games Workshop paint pot. This would have worked nicely, if I was able to keep the edge clean. But it didn't want to stop from feathering. Attempts to used green stuff to smooth it out proved fruitless too. The next attempt was to use some of my resin. This, my thought was, would allow it to form a perfectly round shield. But both tries I did on that, one pouring it into the bottom of a paint palette slot and the other forming a mold for it, also didn't work out. In the end I did one last try and it was to roll up some green stuff and attempt to make a disc out of it. This time I rolled up a little ball of putty and flattened it out on to some wax paper. Then I formed it a bit more circular with my sculpting tool and got it looking pretty good. But it was still too flat. So I plucked it off of the wax paper and set it on top of a GW paint pot and formed it around the top piece. After letting it sit over night I pulled it off and it looked perfect! Once it was all painted I added a couple straps over Cap's arm to make it more realistically mounted. I was really worried about painting the shield. The thing is a bunch of perfect circles and a star. I wasn't sure how well it would turn out hand painting the lines on there. In the end it was painted with a base of red (meaning I only had to make one line), followed by the blue centerpiece, and finally the white stripe and star. Once that was dry it was glossed to give it a more metallic-like shine. I'm extremely pleased with how it came out. And even more excited about it, because I'm not sculpty at all. Seeing the end product and getting compliments on it is a huge ego boost. His base was painted in the same vein as the others. 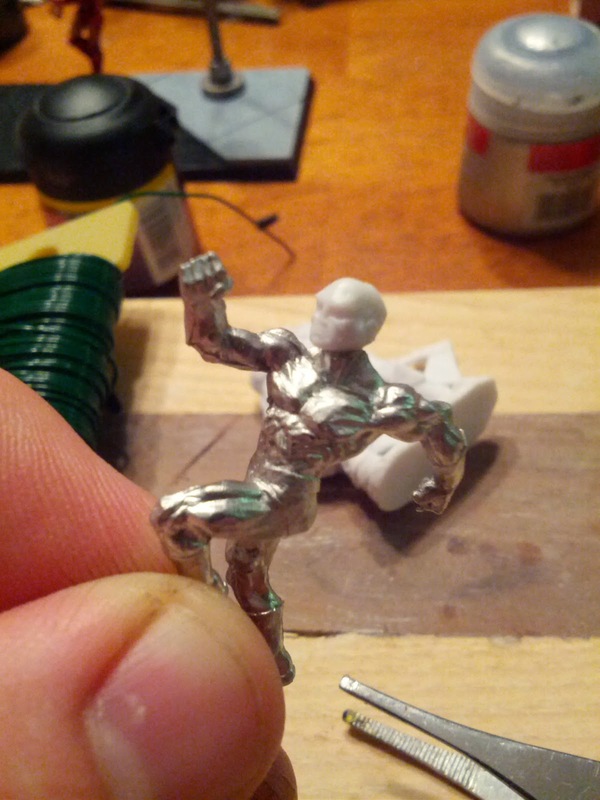 I originally wanted to put him on a 40 or 60mm round base, like the Hulk. But I didn't have any extra laying around. 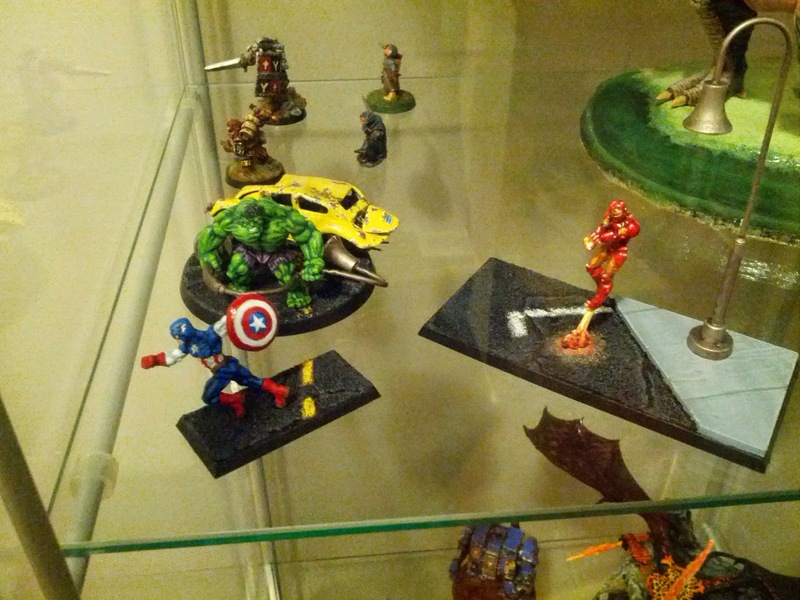 And I knew I didn't want to put him on the same base as Iron Man. Instead I went with an old GW horse base that was laying around, and painted it up as if he was running across the street. The plan all along has been to make it so the Avengers line up together and form a set piece, even if the bases don't actually touch and I think that it works pretty nicely. 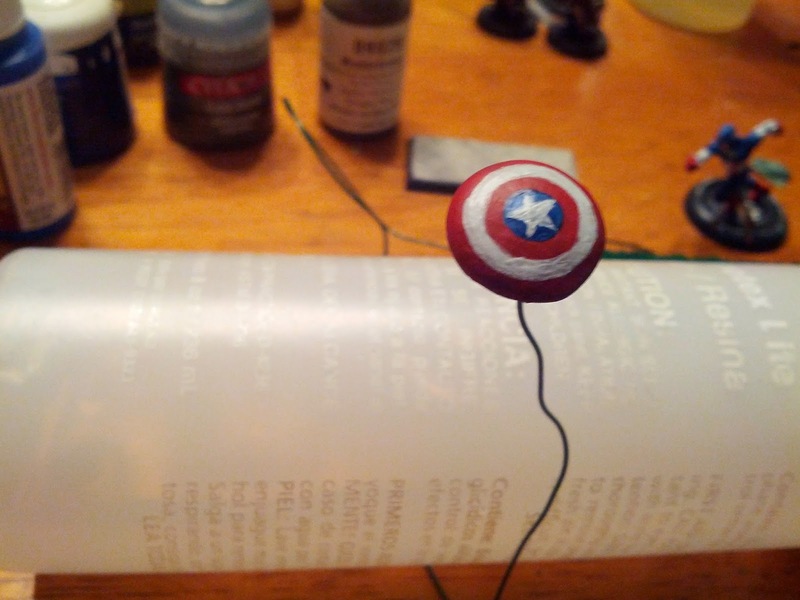 Overall, painting the actual mini for Cap wasn't that difficult at all. I had to keep a close eye on where his face mask should be open and I did have a little trouble with his eyes. All the little details like the wings, stars and stripes were pretty simple. Though I did almost forget to put the "A" on his forehead. I'm not sure if the Blue is too dark in some places though and maybe I should have started with a different base shade. But all in all I think he turned out pretty sweet. Especially with all the conversion work. I've been asked if I'm going to do Black Widow and Hawkeye too. But I don't think so. The last one I am planning to put into the set is Thor, but it might be awhile. I need to look into options for him and decide how I want to go about it. Oddly enough, the character closest to the fantasy is going to be the hardest. I might end up doing a massive conversion in order to get him to work. We'll see.